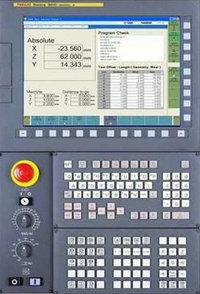 Fanuc cnc control has many versions with variety of different cnc programming techniques and styles. As some fanuc cnc controls (Fanuc OT/16T/21T) use Two-line format for canned-cycles (G71, G72 etc). But other fanuc cnc controls (Fanuc 10T/15T) use One-line format for canned cycles (G71, G72). Below is the Fanuc G72 facing cycle One-line format version described in full detail. P & Q – The cnc program blocks between the P block number and Q block number will be repeated until the end dimension is not met. F (feed-rate) – The benefit of using F (feed-rate) in G72 block is that during facing cycle machine will use this feed-rate, and will ignore any feed-rates given between P block and Q block program. The feed-rate given between P block and Q block program will only be used if you call G70 Finishing Cycle later in program with same P block and Q block numbers. This is very handy way gives cnc machinist opportunity to keep different feed-rates for “rough facing cuts” and “final finishing cut”. 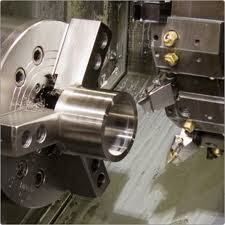 S (spindle speed) – works the same way to keep different spindle speeds for roughing cuts and finish cut.